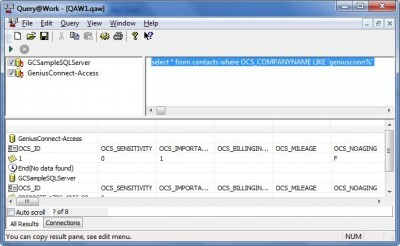 Query@Work 1.0.0.2 is other software developed by Genius@Work B.V.. This program is shareware, which means you can download and use Query@Work 1.0.0.2 for free during 30-days trial period. After this period you gonna have to buy Query@Work 1.0.0.2 software for $9.00 or uninstall the program. Query@Work 1.0.0.2 supports English interface languages and works with Windows 98/XP/Vista. Latest Query@Work 1.0.0.2 does not contain any spyware and/or advertise modules, allowing installing it with no worries concerning valuable information loss. Our website has thoroughly tested development product Query@Work 1.0.0.2, written the review and uploaded installation file (557K) to our fast server. Downloading Query@Work 1.0.0.2 will take several seconds if you use fast ADSL connection. 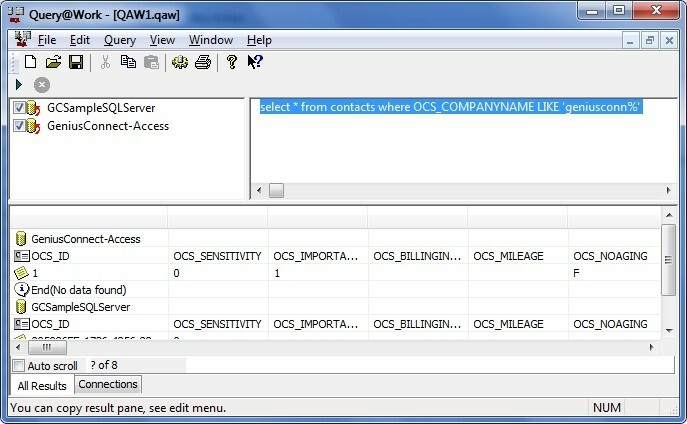 Silverwolf's SQL Query is a Simple Tool to Connect to a MYSQL or ODBC Database and Display the Records in a table view. QueryODBC is a simple tool used to run queries against ODBC data sources on the Mac.